Cairn Terriers are small, hairy terriers with sturdy and well-proportioned frames. Their weather-resistant coats are shaggy on the outside and soft underneath, coming in almost any color. They have broad heads with bushy tops and eyebrows. Their muzzles are medium-length and solid; their eyes are wide, dark and deeply set, and their ears are small and pointed. Cairn Terriers have short backs, sturdy legs and short tails. Cairn Terrier. Photography by Kayla Bertagnolli, as captured at the 2018 Westminster Kennel Club Dog Show. One of cinema’s most famous dogs, Toto from ‘The Wizard of Oz,’ was a Cairn Terrier. But most owners would agree that Toto is not typical. Cairn Terriers, while lovable and fun, are not the cuddly types. They have powerful hunting and working instincts that they put to good use throughout the house and yard. Cairns love to run, explore and dig. If they see a squirrel, rabbit or some other unfortunate little creature they will chase them. Cairn Terriers are devoted pets. This can evolve into a fierce protectiveness and sometimes competitiveness for their master’s attention. However, with the proper training, they can be comfortable around new people. Cairn Terriers are exceptional watchdogs, smelling intruders from a good distance and barking relentlessly. Easily trained, Cairn Terriers like to learn tricks. They also love task-oriented activities and games. 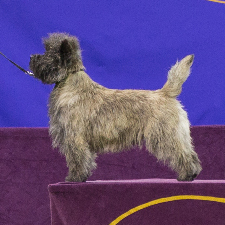 Cairn Terriers are big competitors and love to win. They also have a durability that makes them great hunting and exploring companions. Cairn Terriers have powerful hunting and digging instincts. Proper training can mute some of their more willful tendencies, but be aware that they love to dig in the yard. Some say that this breed is incorrigible and disobedient. This is not true. As with most terriers, proper training and a firm hand can keep them on the straight-and-narrow path. Cairn Terriers will be okay in apartments, but they need lots of exercise and companionship—not just playtime around the living room. If a Cairn is neglected or doesn’t get enough exercise, it can get moody and destructive. Remember to always walk Cairn Terriers on a leash. Their curiosity and lightning quickness makes for a dangerous combination in parks full of squirrels and pigeons. A healthy Cairn Terrier can live as long as 15 years. Common health problems include cataracts, allergies and hip dysplasia. They should be groomed regularly to prevent matting. Also, try not to overfeed them: An overweight Cairn Terrier can develop health problems. Cairn Terriers were developed from a strain of Skye Terriers in the highlands of western Scotland hundreds of years ago to serve as hunting dogs. Named after the piles of stones—known as cairns—used to mark property lines and graves in that area, the Cairn Terrier proved to be very helpful routing foxes, squirrels and other small animals from their dens. Cairn Terriers were introduced at an Inverness dog show in 1909, but the judges disqualified them since they weren’t proper Skye Terriers. The new name was suggested and in 1912 Cairn Terriers were permitted to compete. They were registered by the AKC in 1913 and have been popular American pets ever since. 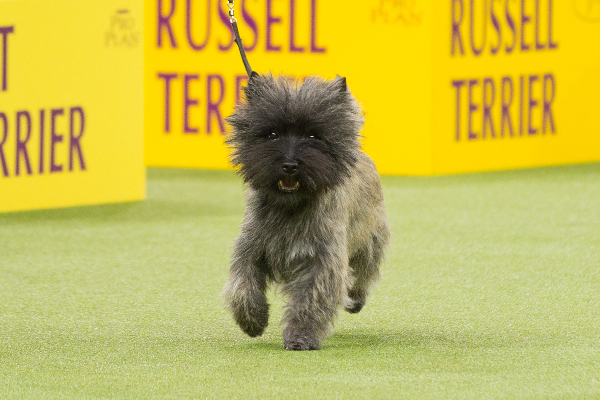 Get to Know the Cairn Terrier — and Toto, Too!